This Web site is the point of view of Eddie Holden. This is how Eddie saw the world. THESE ARE SOME OF THE SUBJECTS I HAVE WROTE ABOUT TO JUST WET YOUR APPETITES, I SHALL BE ADDING TO THESE AS I GO ALONG SO KEEP SURFING IN ON THE WEB AND PERHAPS LEARN A BIT MORE AND HAVE A LAUGH AT MY EXPENSE. (EDDIE). 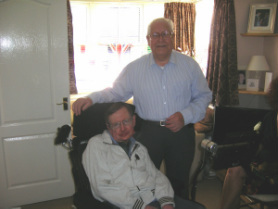 Meeting Professor Stephen Hawking. July 2012.